Hilary John Deacon, one of South Africa's most eminent prehistorians whose work defined the context for the current discourse on the evolution of modern humans, died in Stellenbosch on 25 May 2010. Hilary was born in Cape Town in 1936, where he matriculated at Christian Brothers College in 1952. His education continued at the University of Cape Town where he graduated first with a BSc in geology and archaeology in 1955, followed by three further degrees in archaeology: a BA (Hons) in 1962, MA (with distinction) in 1966 and a PhD in 1974. His early professional career alternated with his formal education. He worked as an exploration geologist in East Africa, the United Kingdom and Ghana between 1956 and 1960. In 1962, he became an archaeologist at the Albany Museum in Grahamstown, where he was later promoted to Deputy Director. 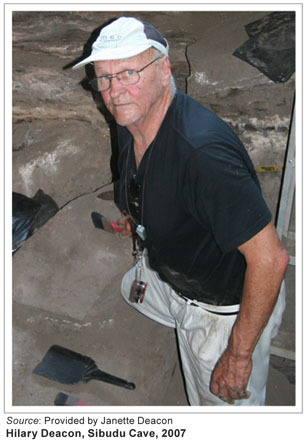 In 1971, he took up a senior lectureship at Stellenbosch University, where he rose in 1979 to become its first (and only) Professor of Archaeology until he retired in 1999. During this time he also held visiting appointments at the University of Chicago (1978), the Australian National University (1984) and the University of California at Berkeley (1986). In addition to his research and teaching, he contributed to public archaeology as a member of the National Monuments Council (1989-94), the Council of the South African Museum (1986-98) and the Iziko Museums of Cape Town (1998-2007). He was honoured by being named President of the South African Association of Archaeologists, the South African Society for Quaternary Research and the South African Archaeological Society. He was a life member of the South African Society for Quaternary Research and the South African Museums Association. Two themes, his dual training and his teamwork with Janette, defined and enlivened Hilary Deacon's career. He was first and foremost an original researcher, whether in the field, the laboratory or the museum. His intellectual purpose was to infer the evolution of human behaviour that lay encoded in the archaeo-geological record. His passion lay in getting things straight, whether by excavation or analysis of residues ranging from stone, bone and wooden tools, to soils, shells, bones, speleotherms, ochre and straw bedding. His gaze never wandered from the prize  the testable and verifiable processes, events and sequences that comprise the past  and to this end, he pursued a broad range of problems from the earliest human record to the ethnographic present. But it is in his magisterial reworking of the problematic sequence at Klasies River Main that the mettle of the man emerges. Earlier excavations had yielded evidence for anatomically modern humans dating back 100 000 years, but the exact dates and associations required confirmation and clarification.11 Hilary resolved many issues by slicing through the equivocations.6 The elegance of his presentation set the standard for recent work by a younger generation of archaeologists at sites like Blombos and Pinnacle Point, freeing them in some respects from constraints of chronology, to speculate instead about the emergence of consciousness, symbolic thought and modernity in human evolution. My friendship with Hilary was always tinged with awe. Janette and I were students of Ray Inskeep before this handsome, blond man strode into the African Studies department at the University of Cape Town. We worked on Inskeep's early excavations at Hopefield (Elandsfontein) before Ronald Singer hired Hilary to elucidate the geological conundrums of the site. We went hiking through the scrub at the caves behind the Wilderness before Hilary and Janette joined the Albany Museum in Grahamstown and clarified a century of collections housed there. When we met up again in Grahamstown shortly after they first landed there, you could see at a glance that they were a team, his seriousness balancing the light touch that Janette brought to bear in managing a growing family, guests and her own stone tool analysis with ferocious love and efficiency. He was unswerving in his commitment to the past and he chased his vision of an integrated multi-disciplinary approach with single-minded persistence. The consummate professional, Hilary remained focused on understanding the human past at the southern reaches of Africa from his youth until his last days. He was never a man for social engagements, nor for the long 'boozy' sessions that animate archaeology. Once, after driving for two days, I eventually arrived at a remote site he was digging only to find that he had struck camp two hours earlier, leaving a message that his party had gone down to the shore to investigate another site, and if we really wanted to see him we should turn around immediately and drive fast. But the converse of this was that if Hilary Deacon liked your work, your day was made. A few years ago he and Janette took me to visit Judy Sealy's excavation at Hoffman's Cave on the Robberg Peninsula at Plettenberg Bay. The region abutted on his old stamping grounds at Klasies River, and he knew it well. We called in at the best pie shop in the country (pretty good), ate an immense lunch at the old hotel at Albertinia (not so good), peered at the broken Asian ceramics from the San Gonçalo shipwreck at the Plettenberg Bay Museum and watched the lights of the chokka boats gleaming out in the bay after dark. Walking along the spine of the Robberg Peninsula, I envied the way he leaped from rock to rock, and listened closely as he pointed out the ancient rock formation at our feet and the only tombola on the African coast in the distance. Cutting lightly across the wet rock face below the cave he scrambled across the mats laid out on the surface of the deposit and listened as Judy explained what she had found. Gentle questions, a few 'hmm's', a breather outside for a smoke, and his 'seems good to me' set the seal of approval on the work, eliciting smiles all around. One of my last walks with him was along the Platteklip stream where my student Liz Jordan had excavated the pools of colonial washerwomen. Morning mist wreathed a few exotic palms and pines spared by the chainsaws of the alien vegetation eradication brigade. Hilary strode around naming the smaller indigenous trees and bushes that emerged sparkling as the sun broke through. He talked about how fynbos flourished in this shaded ravine and how palms and pine trees now document the colonial imprint. He wondered whether the stream had scoured out everything but the latest occupational traces in the washing pools. But mainly we talked about cats. Hilary still smarted over the loss of Chairman Mao ('He sits on the chair and he miaouws'), his immense tabby cat, who liked to wreath around Hilary's feet on bowed legs. That day he was anxious about Nigel, a ginger tomcat. Despite being spoon fed, the animal seemed poorly. I had similar misgivings about my cat in the United States. Only cat people will understand this anxiety. By nightfall, both were dead. A short obituary notice appeared in the Cape Town classifieds to announce Hilary's passing.12 His wife, Janette, and his three children -Andrew (Toz), an IT specialist at UCT, Harriet, a social historian, and Melissa, a London lawyer  described him as their 'inspiration'. They were not alone there. Hilary set the bar high for teamwork, intellectual strength and sheer achievement. He forged the present structure of the field with his breadth of vision. His legacy will be the archaeology of the new century.